Today is owl day since I've posted two owls today. 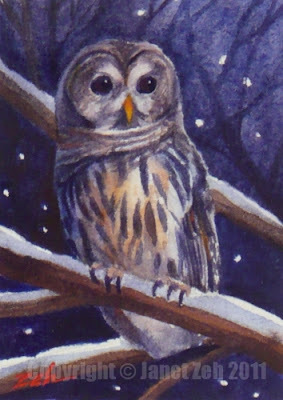 Perhaps it's the frigid cold nights we have been having that are making me think of owls out there hunting in the dark. The barred owl is one I hear often when the weather is warmer and the windows are open at night. It has a distinctive series of hoots that end with a downward AW sound. This large owl is also distinctive because of its deep brown eyes. Most owls have yellow eyes. I've painted this owl against a midnight sky full of stars. You can see the sky part of the painting in the video demo below. 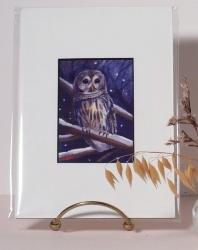 The original is sold, but you can get a print of it in my Fine Art Prints shop here: Barred Owl print. I love your video! You have such a nice voice. I wish there was a bit with you painting the detail on the owl, though. I'd like to see what brushes you use to get the fine details. Well, that will be for another video! :) Thanks for the nice comments. Thanks Savvy Seller. ;) You have a great logo!